The web server with the IP-address 173.230.250.150 used by Cid-unesco.org is owned by Acenet and is located in Southfield, USA. 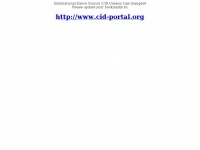 The website Cid-unesco.org has a own web server. The web server only runs this website. The websites of Cid-unesco.org are served by a Apache server. The markup language of the website is XHTML 1.0 Transitional. Due to the robot information on the webpage, the following actions by webcrawlers are not allowed: indexing the website. All other actions by webcrawlers are allowed.